A great boost on a G77-7R. 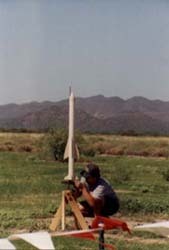 Below are four pictures of Delta E prototype #1. It has successfully flown on G64's and G80's. 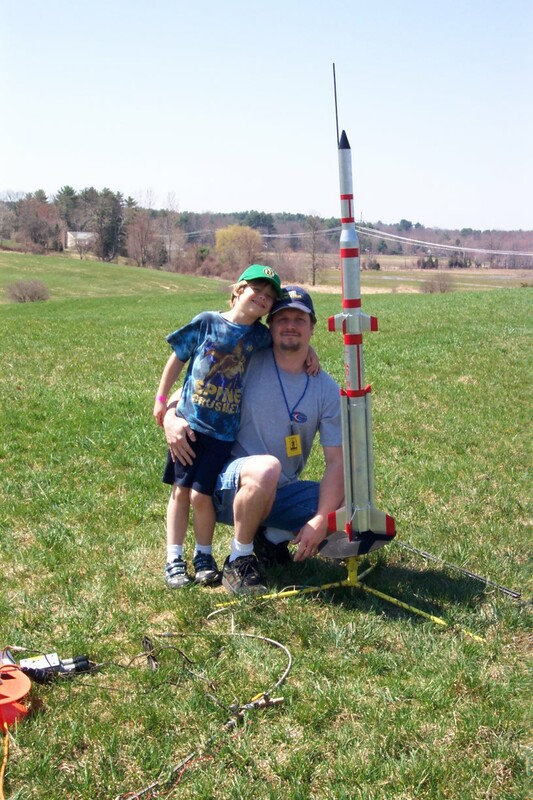 Prototype #2 has successfully flown. This prototype has boosters that drop off during the boost. Below is a picture of the aft end of prototype #2. 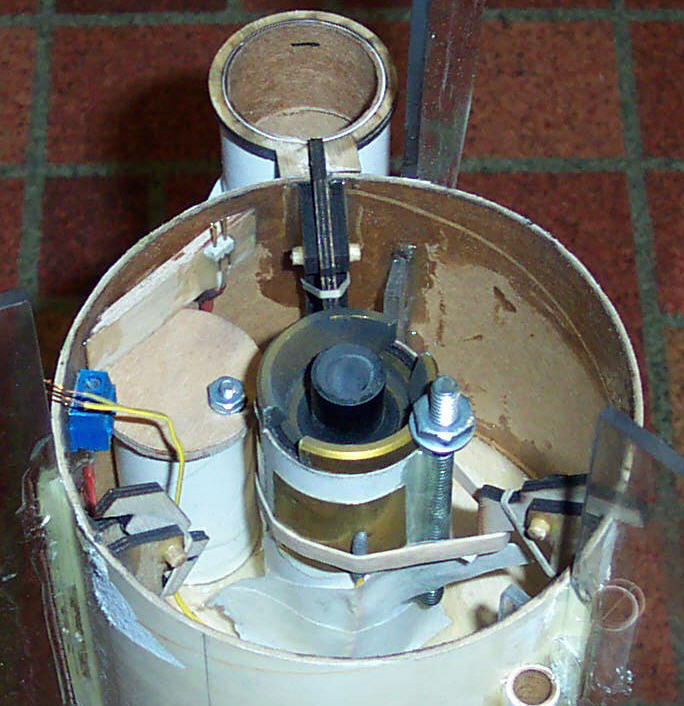 The timer sits in the tube to the left of the MMT. Above this is the pull-pin contacts. The blue piece to the left of the timer tube is the secondary ignitor hook up. 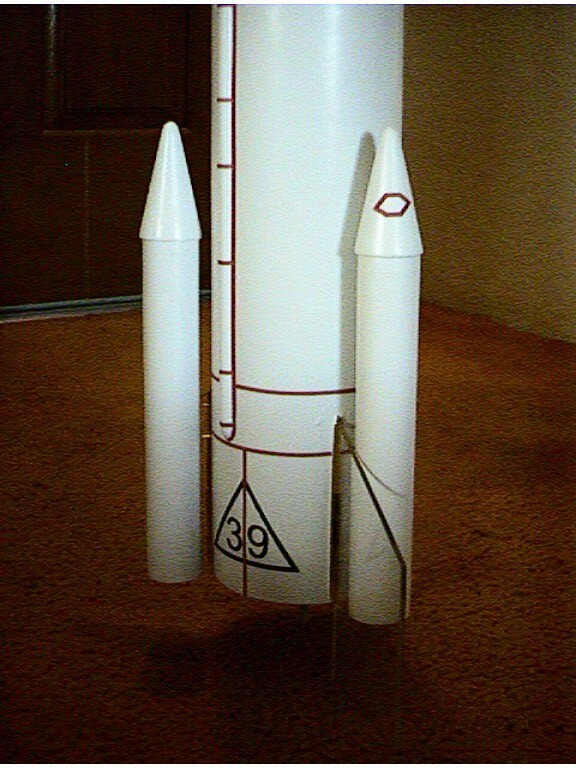 At three places around the inside of the body tube are the booster deployers. The top one is holding a booster. 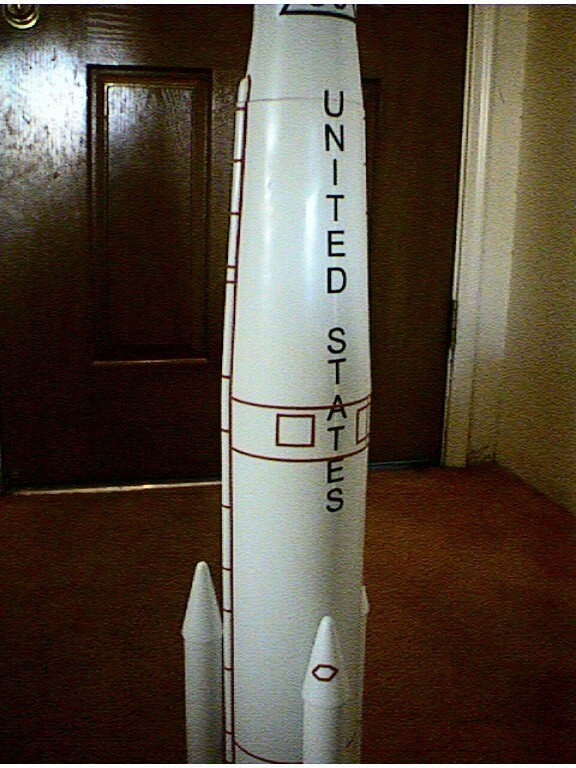 The right one is in the hold position without a booster. The left one is in the activated position. 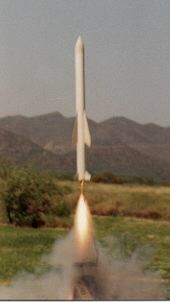 The booster attachments are not shown (they were ripped off after this unsuccessful flight. 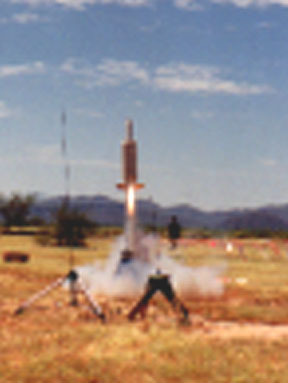 At launch the pull pin actives the timer. The timer then activates the secondary ignitor. This ignitor burns through a loop of stretchable cord (this replaces the thick elastic in this photo). When the cord burns through, the three small elastics open the booster deployers. This allows the boosters to drop free and tumble recover. Simple, huh? 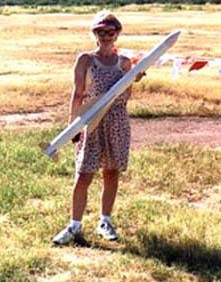 X15 prototype #1 has flown once. 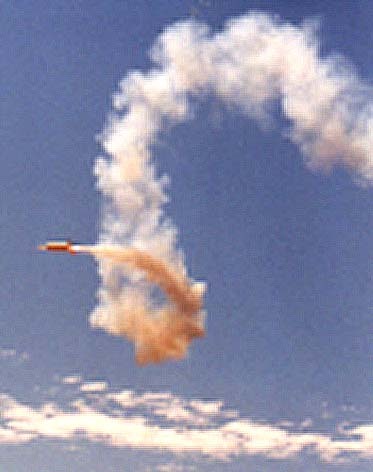 The flight produced one loop, a perfect transition into a glide and a perfect chute deployment 10 feet off the ground. I'll be moving the nose weight further into the nose cone and eliminating weight from the back-end. I've started to make the masters for the vacuum formed parts. This should take several months to finish as it is taking longer than expected to get the fairings just right (BTW, the glide was unintentional and the final kit will not glide). The cardboard/balsa fairings, tail cone and tail surfaces will be replaced with vacuum formed parts. 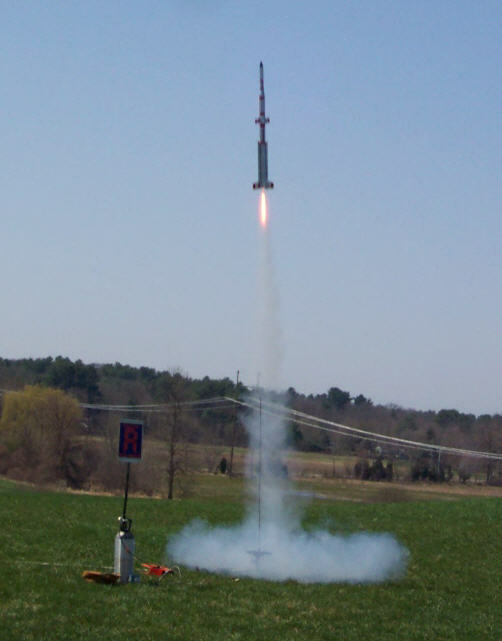 The Exocet is currently in flight proving. I will move it into beta testing ASAP. I'm still looking for some good sources of details and markings. If you know of any, please let me know. The Titan IIIC proved to be too unstable with a cluster of two motors. When the ignition was simultaneous, the flight was good, but any delay in lighting one of the motors would send it cartwheeling across the sky (and ground!). I'm currently re-designing it for one motor. I'll also be adding several vacuum formed parts to the kit and re-designing the fins using clear plastic so that they are less visible.